The 14th of Adar. (March 21st, 2019) The majority of Jews celebrate Purim on this day, and they have been doing so for about two and a half millennia. Reason: This is the day that the Jews rested from the battle against their enemies. The 15th of Adar. (March 22nd, 2019) A minority group celebrates Purim one day later, on Shushan Purim. Reason: The Jews of Shushan (the capital city of ancient Persia) battled on for an extra day, getting their respite a day later. Shushan Purim is celebrated by those who live in an ancient walled city like Shushan. In our times, there is only one city that celebrates Shushan Purim exclusively—Jerusalem. The rest of us celebrate Purim on the 14th of Adar. Am I merely a bystander? So I ask you, what message can I take from the celebration of Shushan Purim in my beloved Jerusalem, thousands of miles away? Is it my holiday, or am I merely a bystander while Jerusalemites are making merry? I want to suggest that Shushan Purim is our holiday as well! And, in a way, when we understand Shushan Purim better, it might even resonate with us more that Purim itself. Shushan was the capital city of the Persian Empire—the antithesis of Jewish morality and the Holy Temple, which had been destroyed a few decades prior to the Purim story. Shushan was a town of high society. Slick politicos swarmed the streets; wannabe lobbyists pounded the pavement, trying to get the ear of the power brokers; money-hungry wolves devoured their competitors. Morality was relative, corruption was rampant and power was the name of the game. Indulgence was Commandment #1 in this town. King Ahasuerus made a feast that lasted 187 days! Shushan was “The Real World.” And “The Real World” needs a Purim of its own. It’s a story of happenstance. It just happened that Vashti refused to listen to her drunken husband’s wishes. It just happened that Esther was chosen as the new queen. It just happened that Mordechai saved the life of the king. It just happened that Haman was plotting to annihilate the Jews while Esther was queen. It just happened that Esther made a good party and beseeched the king to save the Jews. It just happened that Haman hung from the gallows he had prepared for Mordechai. This was G‑d’s story. The Jews had drifted away from their core, and G‑d chose to bring them back to themselves. He used Haman as a tool. He had planned the salvation before the crisis. Esther was chosen as queen so that when the Jews repented they’d immediately be saved and witness a complete reversal of their situation. These two versions of Purim are the two versions of how we can read our lives. Each of us can choose how to interpret the story. Are we a conglomeration of “it just happened,” or do we see G‑d’s hand in every facet of our lives? Purim is the wakeup call to rip away the paper-thin veneer that hides the Divine guidance of our lives and opt to see the true version of our personal Megillahs. Purim calls upon us to read the subtexts of our lives. Many people can recalibrate their perspectives with a general dose of Purim awareness. These are the people with good, humble values, people who just need a little nudge and they’re back on track! But then there are the heavyweights: Mr. Sophisticated Know-It-All; the polished, slick, cool, on-the-ball, successful man-made individual. 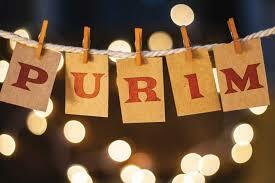 These souls have a Purim just for them—Shushan Purim, with its Divine message: Wake up, buddy. Make space for G‑d in your narrative. When you write your autobiography and you’re tempted to make “I” the most-used pronoun in the book—whether in relationship to your accomplishments or to your failures—just remember the subtext of the story. It’s G‑d’s world. Perhaps our modern world can relate to Shushan Purim in a way that our shtetl antecedents could not have. In a time when the world is open to the “The Real World” (the good, the bad and the ugly of it) more than ever before, when our lives are intertwined in the Shushans of the 21st century, is it possible that the message of Shushan Purim is a Purim message for our time?